If you are a new dog owner you may or may not have heard about mental stimulation for dogs, and the importance of providing it. Many dog owners will focus on giving their dog enough exercise throughout the day, but will neglect in providing their dog with much-needed mental stimulation. All dogs need both physical exercise and mental stimulation every day, in order to be happy and healthy, and live a balanced life. You are probably wondering what is mental stimulation for dogs? Well, mental stimulation is basically exercising your dog’s mind. Dogs are intelligent, and need to have their brain’s stimulated and challenged every day in order to prevent them from becoming bored, and developing bad habits like chewing and excessive barking. If you own a dog that is both intelligent and high energy, then you know how much it takes to tire them out. You have probably gone on long walks, runs, played games of fetch, and still your dog is not tired. Instead, your dog is outside digging a massive sized hole in your backyard! We’ve all been there, wishing that our dog would just lay down and rest, because we just went for a 2-hour-long walk! We are tired and exhausted, so why is our dog not tired? If you are giving your dog more physical exercise as a way to tire your dog out, then you are actually increasing your dog’s stamina, priming them up for more activity. Try adding some mental stimulation for your dog. Dogs who are mentally stimulated will get mentally fatigued, and that makes them tire out faster than getting physical exercise alone. It works the same for us humans, think about it, when we spend all day at work or school learning new things, engaging with other people, and doing certain tasks, we come home and feel tired. We didn’t go out and run a marathon, but instead our brains were working, and being challenged with learning new things, and that has made us mentally fatigued. 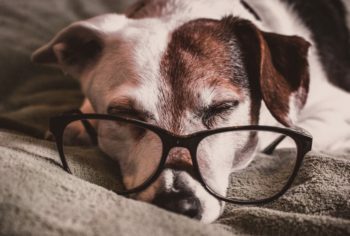 There are many simple ways to provide your dog with mental stimulation, and we will discuss them below, but first let’s look at some signs that your dog needs more mental stimulation. Dogs get bored just like we do, but they can’t tell us how they feel, so it’s up to us to look for some signs that they need to be stimulated mentally. Dogs who pace back and forth, and just can’t get settled, even after physical exercise need mental stimulation. Their bodies may be tired but it’s their brain that is unable to rest, causing them to move around unsettled. Digging is usually a sign of boredom, especially if your dog is left outside in the backyard with nothing to do. If your dog is barking more than usual, or barking at everything, it means your dog is lacking stimulation. Your dog needs something else to do with their brain, besides barking. If your dog is displaying destructive behavior like chewing furniture, or destroying other items at home, it is likely that your dog is bored. Some dogs will develop obsessive behaviors like tail chasing, when they are bored. We’ve all witnessed this behavior before, and thought it was rather amusing, but dogs who constantly engage in chasing their own tail are bored, and need to do something else to stimulate their mind. You may think that your dog sleeping a lot is a good thing, I mean it keeps them out of trouble, and who wouldn’t want that? It’s really not healthy for your dog to be sleeping all day, or more than normal. On average, adult dogs sleep 12-14 hours a day, and puppies sleep more than this. 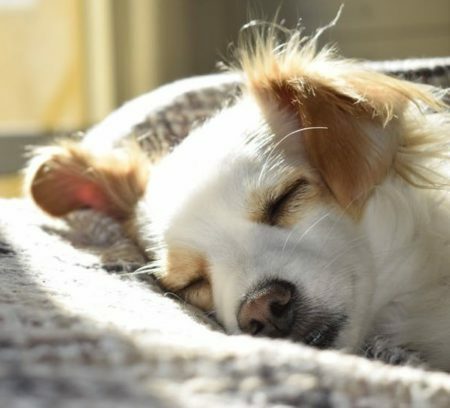 If your dog is sleeping more, it’s usually a sign that they are bored. Giving your dog some much-needed mental stimulation doesn’t have to be complicated, nor does it have to cost a lot of money. The following are some easy ways to stimulate your dog. If you always go on the same walk with your dog every day, it can get pretty boring. The same sights and smells, and the same route will eventually be of no interest to your dog or yourself. Try going down a different street, or doing the walk in a different direction. You could even explore a new neighborhood, a new park, or nature trail, and by doing so, your dog will be stimulated by the different sights and smells, and look forward to every walk. Walking your dog is great for physical exercise, but by letting your dog sniff, it offers great mental stimulation. If you go for leisurely walks with your dog, and you’re not pressed for time, then it’s a good idea to allow your dog to explore the world using one of his primary senses. Some dogs will stop and sniff every few minutes, and if walking is your main agenda, you could set up a time at the end of your walk to allow your dog time to sniff. It is important to let your dog stop and sniff, as sniffing is how your dog explores and understands the world around them. If your dog already knows the basic commands, and is a master at them, then why not teach him some new tricks. If you spend a few minutes each day teaching your dog a new trick, you will be stimulating and challenging your dog’s brain. Remember how fun it was to play hide-and-seek when you were a kid? Well, now your dog can have fun playing it too. You can hide a treat or your dog’s favorite toy in the house or backyard, and let your dog sniff and try to find it. If your dog likes to dig, you could build a sandbox and bury a toy, and have your dog dig to find it. The same works with snow in the winter, your dog will love digging through a snow pile to try to find a tennis ball. Your dog loves spending time with you, so why not take your dog with you on errands. If you are going to a store, or visiting a friend, why not take your dog with you. Your dog will be stimulated by new environments, and all the different sounds, sights and smells. There are many stores that allow you to bring your dog with you, such as Home Depot, and Pet Smart, just be sure to check ahead of time if dogs are allowed wherever you go. Just taking your dog for a car ride, is a great way to stimulate his brain, but if your dog is not allowed in places you have to go, you should never leave them in the car on warm or very cold days. Dogs love to play, but if your dog only plays with you, it can get a little boring. Dogs need to play with other dogs to keep them stimulated. If your friend, neighbor, or relative has a dog, why not arrange for a play date. Just make sure that the dogs get along with each other first, before they engage in playtime. 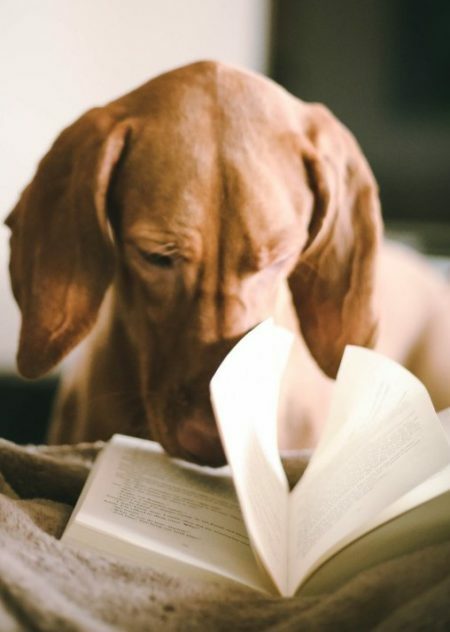 Your dog may know a lot of words, but a great way to keep your dog’s brain stimulated is by adding to his vocabulary. Try teaching your dog the name of all of his toys. Simply start playing with a toy and call it a name, for instance if it’s a rabbit you could name it Roger The Rabbit, the more you repeat the name, the more your dog will associate the name with the toy. Repetition is key, and soon your dog will know all the names of his toys. Chances are your dog has a lot of toys, and plays with the same ones over and over again. Well, that can get pretty boring. Dogs prefer new toys, simply because they are new and exciting, but you don’t always have to go out and buy new toys. If you rotate your dog’s toys every few days, it will keep playtime interesting. I’m sure that your dog has toys that he hasn’t played with in a while, you could try re-introducing them. Your dog will be excited and think it’s a new toy, because he hasn’t seen it in a while. Puzzle toys are a great way to keep your dog busy, and focused on a task. Puzzle toys allow your dog to use some natural problem solving abilities, and will help to stimulate the brain. A popular puzzle toy that dogs love is the Outward Hound Hide A Squirrel, this toy keeps dogs entertained without any treats. Squirrel plush toys are stuffed inside a large plush tree trunk, and your dog has to figure out how to get them out. Each squirrel has a squeaker, which adds to the excitement. Hide the squirrels around the house, and let your dog hunt for them. There are many puzzle toys available, and usually the ones that involve treats are favored by dogs. A Kong toy stuffed with peanut butter then frozen, is a great way to keep your dog entertained and stimulated. Agility training is a great way to offer both mental and physical stimulation for your dog. You could set up your own agility/obstacle course at home, using sturdy containers, garden fencing, rope, and other items, along with your imagination. Teach your dog how to go through the course, and add to your dog’s stimulation by hiding treats throughout the course. Many places offer agility training for dogs, and you could enroll your dog in a course. 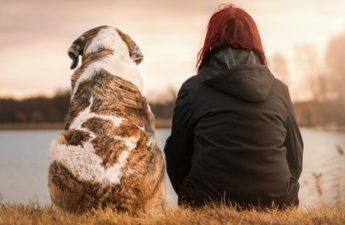 If you have never heard of mental stimulation for dogs, perhaps now you have a better understanding of the importance of providing it to your dog. By giving your dog a combination of physical exercise, and mental stimulation every day, your dog will be happier and more at ease. If you incorporate some easy ways that were mentioned above, for just a few minutes a day, your dog will get some much-needed brain exercise, and will be less likely to engage in destructive behavior. What are some ways that you provide mental stimulation for your dog? If you have any thoughts or opinions about this topic, please leave a comment below, I would love to hear from you. Gosh, what a nice bundle of info for us dog lovers. My twin Shih-Tzu’s requested that I thank you for them now being allowed to sniff. I want the Hide-a-Squirrel for myself. I plan to visit this site a lot. Thank You! Yes, please allow your Shih-Tzu’s to sniff while they are out for a walk. It is so important for them to be allowed to sniff and explore the world around them, sniffing is great stimulation for them. The Hide-a-Squirrel is so adorable, I bought one for my dog and she absolutely loves it! I appreciate your comment, and please visit this site often! I am always adding helpful information, and appreciate any feedback. Jenny, I always enjoy your dog blogs. I’ve been around dogs most of my life and you always manage to come up with some new ideas, which leaves me thinking why didn’t I think of that? Really though, I had never thought of stimulating a dog’s brain. But why not? As you said dogs are smart and they can learn things if we take the time to provide them with stimulus. Dogs get bored with the same dog walks everyday and so do we. Take a new route–your dog will love the new sights and smells. Take your dog with you shopping when appropriate; name the dog’s toys and see if he can learn the names of his toys–what a neat game! All in all, you name 10 ways you can stimulate your dog’s mind, and guess what? You will be stimulating your mind too. Dogs and humans can get bored, and what better way to starve off boredom than to think up new ways to keep your dog lively and active. A great article, Jenny. Thanks for all the ideas. I am so glad you enjoyed this article. We get bored from the same day to day routines, and so do our dogs! New areas to explore will stimulate your dog as well as yourself. My dog doesn’t stop digging.. This post really gave me many ideas!! you simply lit my eyes!! Thank you for your comment. Some dogs just love to dig, but it is usually a sign of boredom. Maybe you could make your dog a sandbox in the backyard, you could even use a kiddie pool and fill it with sand, then bury a toy and let your dog dig to find it. You mentioned that you play laser light with your dog, I do not recommend that you do that at all! Laser lights are extremely dangerous for dogs and cats too! First the laser light can damage your dog’s eyes, and the quick motion of the laser can confuse your dog, and your dog will try to chase it and could accidentally run into objects. There are many articles on the internet warning pet owners of the dangers of laser lights. Please refrain from using laser lights around your pets. I hope this information has helped you out. I take our dog out for several walks, but sometimes she’s just not satisfied. These are some great ideas I’ll have to try out! I love the idea with the peanut butter in the Kong. The only issue is that I think my dog has put on some weight, so that makes me a little nervous. I’ve been giving her these raw bones with marrow in them which helps keep her busy. But then I read that the marrow has a lot of calories. I love these ideas though, and I will certainly use them. Thank you!! I am glad you enjoyed my post. Rotating your dog’s toys really does work, especially if you play with them yourself. In my experience, a toy is always more interesting to your dog if she sees you having fun with it. 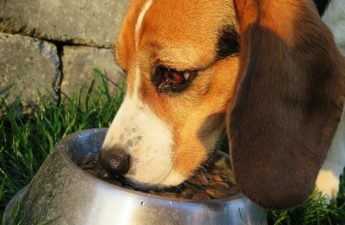 Yes, peanut butter definitely has some calories, you could give it to your dog on special occasions, and not all the time. Just make sure you are getting the unsalted and unsweetened, all natural peanut butter. Raw bones are a good idea too, they keep dogs busy and they help clean the teeth. Marrow is very rich, so if you are worried about your dog gaining weight try looking for leaner bones. I appreciate your comment, thank you. First of all, may I ask what if the dog is still not mentally stimulated after all this activity, will any extra help be needed? If you would reply to that. This post will really be helpful to new dog owners, or the ones that didn’t know what they are doing wrong. The “changing the walk route” is a really big activity all dog owners should take. I used to walk our house dog a while back, and I noticed he was always reluctant to go for a walk because he always had that “I don’t wanna go look have been there before” so I guess I will apply that method now. This post is really eye opening, a lot of new things I would try out now to get my house dog mentally stimulated. Very effective post for all dog owners, I found it very helpful. Nice article. Thanks for your comment, and your question. If you find that your dog is still not mentally stimulated, you should try switching up the games you play, try different toys, teach your dog new tricks, take your dog for a car ride, really anything that is new and exciting will be stimulating for your dog. If you provide physical exercise and mental stimulation daily for your dog, your dog should be well stimulated. I hope that answers your question. If you just try taking your dog to a different neighborhood, or park, there will be different smells and sights to see, and your dog will be excited to go for a walk. I hope this has helped you out, please contact me if you have any further questions or comments. This post made me realize that mental stimulation is important. A bored dog is an unhappy dog that is usually in some sort of trouble. This isn’t good for anyone in the home, including my dog. I will definitely take the time to make sure my dog has enough mental exercise and be sure to switch up the mind games I play to keep everything feeling new and fresh. I am glad that you realize the importance of providing daily mental stimulation for your dog. By offering your dog some stimulation for just a few minutes a day, you will notice an improvement in your dog’s behavior. Your dog will be more at ease and less likely to get into trouble, by engaging in destructive behavior. It’s very important to keep things fresh and exciting for your dog, and that can be done by just changing up your walking routine.